One of the big stories from Washington is that there may be another fight over the debt limit, which could mean…gasp, hide the women and children…gridlock, downgrades, government shutdown, default, and tooth decay. Okay, perhaps not tooth decay, but the DC establishment nonetheless is aghast. Last year, there were actually two big confrontations between House Republicans and President Obama. The first fight occurred early in the year and revolved around spending levels for the remainder of the 2011 fiscal year. I explained in February of that year how advocates of smaller government could prevail in a government shutdown fight, especially since the “essential” parts of the government wouldn’t be affected. But I wasn’t surprised when GOPers buckled under pressure and accepted a deal that – at best – could be categorized as a kiss-your-sister compromise (and, as I noted elsewhere, our sister wasn’t Claudia Schiffer). Then we had the big debt limit fight later in the year, which led to absurd claims that failure to increase the debt limit would lead to default – even though the federal government was collecting ten times as much revenue as was needed to pay interest on the debt. Once again, Republicans were unable to withstand the demagoguery and they basically gave Obama what he wanted after agreeing to a “supercommittee” that was designed to seduce them into a tax increase. Now the game is about to start over. It’s deja vu all over again, as Yogi Berra might say. Here’s some of what the L.A. Times reported. Republicans in Congress are heading into summer much the way they did last year — instigating a showdown with the White House by demanding massive federal budget cuts in exchange for what used to be the routine task of raising the nation’s debt limit to pay the government’s bills. House Speaker John A. Boehner (R-Ohio) is doubling down on the strategy that ended in mixed results last year after the country came to the brink of a federal default before a deal was struck with President Obama. In that go-round, both sides saw their approval ratings with voters plummet and the nation’s credit was downgraded. …The risk for Republicans is not only in presenting another high-stakes showdown at a time when voters have grown weary of the gridlock in Washington. The reporter’s assertion that the debt limit fight led to the downgrade is a bit silly, as I explain here, but that’s now part of the official narrative. On a separate matter, I can’t help but shake my head with frustration that GOPers still haven’t learned that America’s fiscal problem is too much spending, and that deficits and debt are symptoms of that problem. Here’s another passage from the L.A. Times story. No, Mr. Speaker. The problem is spending, spending, spending. Returning to the main issue, the debt limit isn’t the only big fiscal fight that may happen this year. There will also be the spending bills for the 2013 fiscal year, which starts on October 1 of this year. That will mean another fight, particularly since the left has no intention of abiding by the spending limit that was part of last year’s debt limit deal. 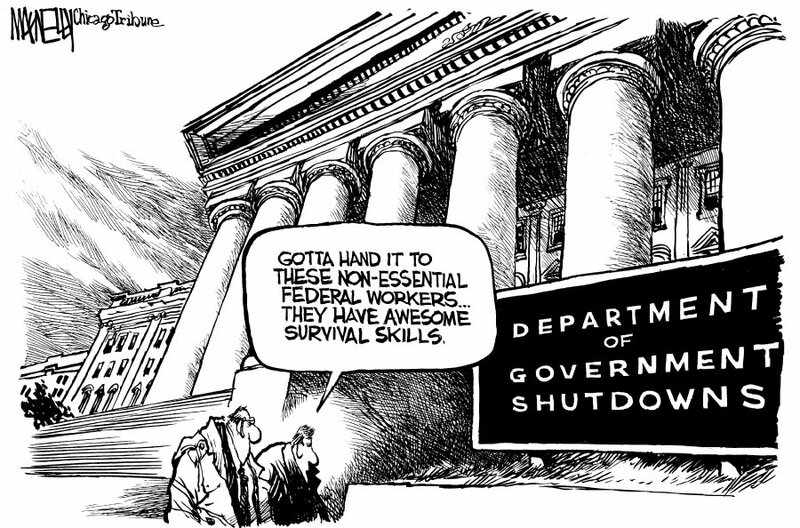 And if Republicans hold firm, that means another “government shutdown.” Though it really should be called a “government slowdown” since it’s only the non-essential bureaucrats who get sent home. In any event, since I’m glum about the likelihood of anything good happening, let’s at least enjoy some good cartoons from Jeff MacNelly. He passed away a number of years ago, but these cartoons from the mid-1990s are just as applicable today as they were then. 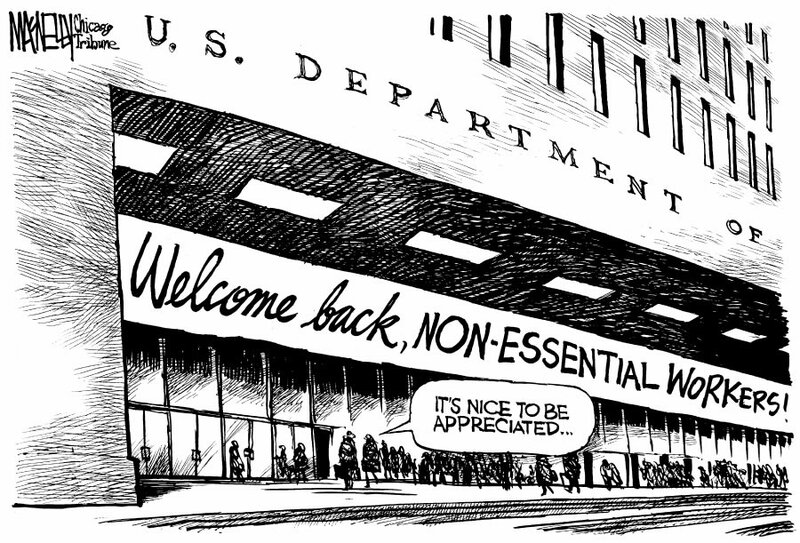 These are amusing cartoons, so long as you don’t actually think about the fact that government is bloated in part because Washington is littered with programs, departments, and agencies that are filled with non-essential bureaucrats. And don’t forget that these bureaucrats are overpaid, getting, on average, twice the compensation of workers in the productive sector of the economy. But I don’t want to end this post on a sour note, so here are some good jokes from the late-night comics about government shutdowns. on March 4, 2013 at 4:02 am Question of the Week: Who Is Your Favorite Political Cartoonist? Fred: If you don’t compromise, I will shoot your sister. Max: Hah! We both know you won’t do that. Fred: I give in. It was a bluff. Max: You should have threatened to shoot my dog. [edited] The Republicans negotiate from “Getting to Yes”. Obama and his ilk negotiate from Alinsky’s “Rules for Radicals.” Obama didn’t want a deal in the recent debt debate. He wanted and got a political process that could be played to his advantage against the “nice guy” Republicans. Following Alinsky, he never made a concrete proposal, just pie in the sky positions. He made the Republicans negotiate with themselves to present something he would buy. Like negotiating with a public employee union, if you start by wanting an agreement, you wind up compromising yourself into their position. That is what Boehner and McConnell did. The Republicans started with “default for a few weeks would be better than your continued spending and increasing debt”. But, they fearfully accepted insignificant and false spending cuts rather than endure what the Democrats claimed was irresponsible and ideological politics. The Republicans argued for the good, but their negotiating position became a bluff, and the Dems called it. They won’t do any better this time. They would have to construct a detailed bill which would continue the government “in emergency”. They can’t call it a default. It would provide for debt payments and the suspension of non-essential government workers until the Dems come to a deal. The Pubs would have to call it an Emergency Spending Act and link it to education about just what the country faces. Make the education the news, not an act of default. Whatever the Pubs threaten, it has to be something that they would want to do. We need more brave souls like those 66 that voted against raising the debt ceiling last year! !